Whole red snapper roasted with a sauce made from onions, fennel tomato, garlic, sunchoke and asparagus. Because the seafood at my local grocery store is often either too old, or too expensive I don’t buy a lot of fish. I do swing by the seafood counter between the produce and the cheese though because every now and then, they have something truly special. Today was one of those days. They had a display of beautiful whole red snapper nestled in fresh chips of ice and it was on sale for $10.99/lbs! Honestly, I was sold after seeing their clear eyes and blood red gills, but the sale price triggered some sort of thrifty Asian reflex and I had a freshly scaled and gutted whole snapper sitting in my basket before I knew what to do with it. With truly fresh seafood, I love simple preparations. Olive oil salt and pepper were the first thoughts to enter my head, but since red snapper isn’t the most flavorful fish, I wanted to give it some kind of sauce. Luckily, I’d also stopped by the Union Square farmer’s market and had some beautiful tomatoes, sunchokes and asparagus sitting at home. The image I had in my head was something like an Acqua Pazza, but I wanted more veggies and less water. Because different vegetables require different cooking times, I divided them up. The sunchokes were parboiled so they’d cook all the way through during their short stint in the oven. The onions and fennel were sauteed along with garlic, to soften them and get a little Maillard reaction going. The tomatoes went in with the fish, and the asparagus was sprinkled on during the last few minutes of roasting. What came out of the oven was a perfectly cooked melange of veggies that acted as both sauce and side dish for the fish. I topped the dish off with some chopped mint because I thought it would go nicely with the fennel (and it was the only fresh herb in the fridge), but this would also be great finished off with basil, parsley or rosemary. 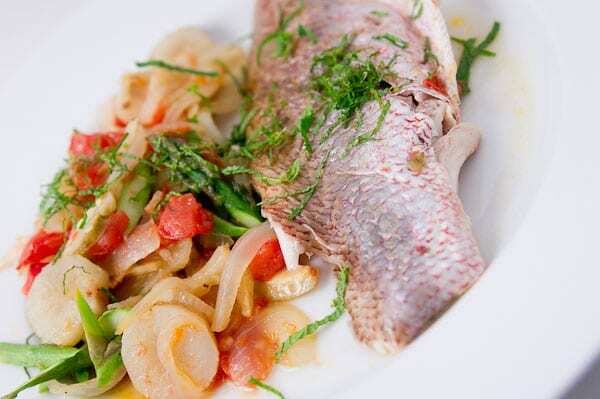 The snapper and veggies come together as a sweet and savory dish, permeated with the aromas of caramelized onions and fennel, sun ripened tomatoes, and accented by some green notes from the bay leaf and mint. It’s light, flavorful and simple and yet it makes for a great party dish because of the fun presentation. This recipe makes enough sauce for 2 fish, so if you need to feed 4 people it’s a simple matter of adding a second fish before roasting. Parboil the sunchokes in salted water until they are tender, but not mushy. Trim all the fins off the snapper and dry with a paper towel. Put the oven rack in the middle position and preheat to 450 degrees F.
Add about 2 tablespoons of olive oil to a large chefs pan and heat over medium high heat. Add the garlic and saute until fragrant. Add the fennel, onion, and bay leaf and saute until the vegetables start turning brown at the edges (about 10 minutes). Add the tomatoes and salt and pepper to taste. Add the parboiled sunchokes, then make a little space in the middle of the pan for the fish. Generously salt and pepper both sides of the snapper as well as the inside, then spread the belly out a little so the fish can sit upright in the pan along with the sauteed vegetables. Drizzle with olive oil and put the pan in the oven. Toss the asparagus with olive oil and salt and pepper. After the fish has been in the oven for 15 minutes, sprinkle the asparagus around the fish and put it back in the oven and continue to cook for another 10-15 minutes, or until the fish is cooked all the way through. You can test it by sticking a fork or knife straight down into the meat around the spine and pulling away the meat. It should come away from the bone easily and be opaque. If it doesn't or the meat looks translucent, cook it a little longer. Sprinkle with chopped mint and serve whole with the vegetables. It does look incredibly fresh and vibrant. Gorgeous! My first instinct whenever I buy fresh, whole fish is to steam it Chinese style, very simply with ginger and scallions. This looks incredibly beautiful, and definitely showcases such a gorgeous fish! HI Marc! How are you? This is such a fresh original recipe, I love the colors. The lighting on the fish in the first pic is extraordinary. Looking forward to exploring your recent posts…it’s been too long. I just made fish dish just this weekend!! I love how you captured the dish from the head first. I’ll be writing in article in a week or so on mine. I had never cooked a whole fish before and eager to give it a try. Super photography! Nice presentation! I like the fennel bulb in this recipe. I am sure that adds nice flavor to the fish. Cool photography and great recipe – however, what is a sunchoke? Your whole site is packed with good things. Congratulations. I’m quite fond of snapper but we’ve been only buying import fish because of the nuclear concern here in Japan, that aside, I do have some tuna, could I use that? and cook it to your desired temp. 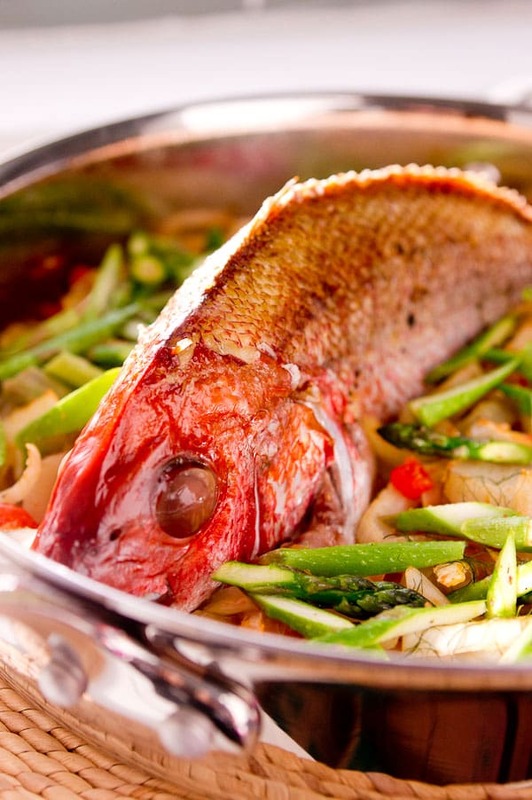 Yep, a whole snapper is not something I ever see in the market over here… But it does look lovely! In case you bake the fish in a closed vessel, like the Corning/Pyrex baking dish with a lid, or if you wrap the fish in aluminum foil, tuna will not dry out, but remain moist and juicy, if it is fatty tuna belly then it will be heavenly. What should be the oven temp for roasting? So where can you buy this sunchoke???? When they’re in season I’ve seen them at Whole Foods, but I see them the most at farmer’s markets.